Gelegen op de eerste verdieping, dit met twee slaapkamers, twee badkamers, appartement is volledig ingericht. Dit zwembad vakantie condo geschikt voor maximaal zes personen. Het condominium complex ligt direct aan de Golf van Mexico met prachtige witte zandstranden klaar voor jou. Het is gelegen in de buurt van de steigers die geweldig snorkelen en vissen bieden. Kom zien waarom wij denken dat Destin, Florida is de plek om te kiezen voor uw volgende "Vacationing Paradise!" This condo is nice, could stand some updates. It’s not what I expected as I thought that the patio opened up to the pool. The patio opens up to the parking area (this does make it easy to unload luggage). The main door is caddy corner to the gate that goes to the pool area. The bed in the master room was very comfortable and all seemed very clean. Overall, it was a great place to stay as you are pretty much on the beach most of the time. 100 yard walk to the snorkel area and another 200 yards to the beach. I’ve stayed at Poolside Villas before. The addition of the security gates are a nice update. The walk to the snorkel area is less than in 2010, evidently because they dredged sand from that area and expanded the water front. The only negative I have and it would pertain to the whole Condo and not the owner, is that now a Hotel has taken over the area pretty much straight out behind the condos and made it like a “private” beach area. They boat everyone in from the hotel to the beach area and have umbrellas and chairs set up and only available to their guest. There is still plenty of room on the beach towards the jetties and you will have to walk a little further. Another downside to the whole Destin area is that it’s getting very commercialized and the traffic is ten times as bad as it was in 2010. Again, this has no bearing on the owner and is just from popularity. All and all we had a great time and enjoyed the stay. Loved the area but condo can use some work. Was ok. Can use a lot of work. No kitchen towels, only a roll of toilet paper and no bed sheets or blanket for pullout bed in living room (no problem since my daughter had brought a blanket). No curtains and needed paint in many spots (where curtains were gone different color than wall). Cleaning person wasn’t too good, had to clean a lot when we arrived in bathroom sink and wall. Cabinet door in kitchen was off hinge when we opened the cabinet door so we were charged for this. It was like this when we arrived, we didn’t even open cabinet till a few days into our stay so I didn’t say anything to Kathy but apparently I should have since we were charged off our deposit for this (my fault, live and learn). It was fine for the price. Location was fabulous! to replace wall socket and re install cabinet door. 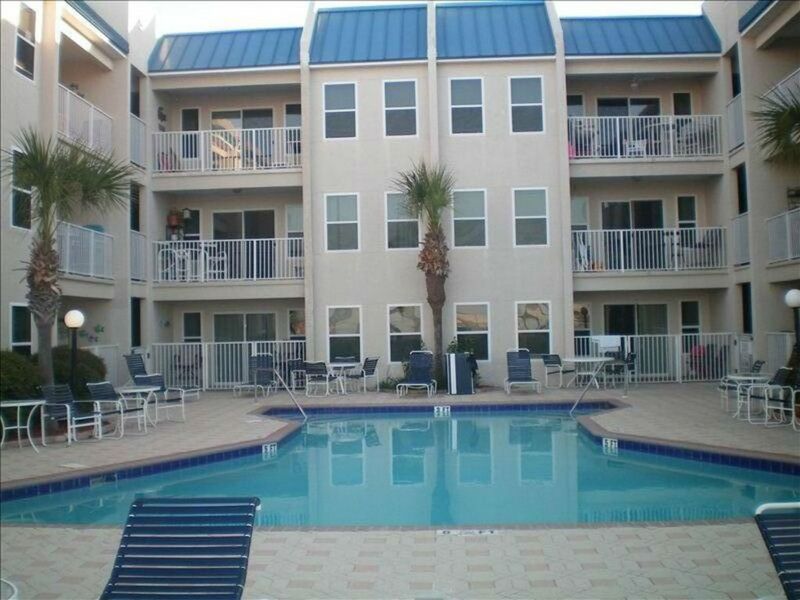 great location, condo was in good shape, nice and clean, property well kept up. Pool area was nice. The beach is a bit of a walk but no big deal. The only complaint is that the beach is shared with the Emerald resort and they boat people over all day and their chairs and umbrellas take up alot of the beach, you will need to go far right or far left to get a place to put your chairs. This has no bearing on the condo owners, it is not their fault. Otherwise weather was great and condo was great. Would definitely come back if we come back to Destin. Make sure to visit The Back Porch cafe,, great food!! When we arrived; I had forgotten the code to the gate that Kathy had sent to me with the key. Some one who works there hesitated, called Kathy and finally let me in, he apologized for not letting me in right away but I clearly understood this was my fault. Kathy contacted me back but it had all been corrected quickly. We pulled right up to the unit to unload our stuff and felt like at home right away It was my Husband and I and our two grown kids 18 and 23 and we were very comfortable. The pool is 5 steps away from your back door, we walked on the beach for miles and miles, took beautiful pictures on the jetties, in the evening we would walk to the public beach at the end of the road to watch the sunset and enjoy looking at the boats. It felt very safe and peaceful. This condo is in a great peaceful area. The condo was clean, plenty of towels, plenty of seating, TV in every room, and the Kitchen was well equipped. The surroundings outside the condo were clean and no one bothered us for nothing. I would definitely stay here again perfect place to unwind. My husband and I have stayed here twice. The first time in 2012, and the second June 2014. We used to stay at the Islander which is also very nice, but these owners are much more pleasant to deal with. Also, I enjoy staying by the Jetties. I was pleasantly surprised by some of the renovation and upgrades since our stay in 2012. I find the negative review shocking.. I have stayed at this condo three times, and just finished a great Thanksgiving week there.. A bit chilly.. but like the color of the water mentioned in the pevious post... Mother Nature's fault not the Owners! Water was beautiful and clear for us! If you want a comfortable condo with a pool and an incredible view.. gorgeous white sandy beach that is NEVER crowded.... This is your place! Updated Tommy Bahama furniture, new stove, large screen tv in family room, tv's in both bedrooms.... and more importantly.. CONVIENCE! You can literally pull up to the back door.. Move in.. And walk out the front door to the pool. I found the Owner to be Terrific.. Kathy was caring, kind, and very responsive. I much prefer this condo to the high rise type properties. Will be returning as soon as possible! gelegen in het hart van Destin Holiday Isle op golf van Mexico.